Will there be a new daytime haven for D.C. residents who spend their evenings in the shelters? Most shelters require guests to leave early in the morning and not return until a specified time at twilight. For any of those residents who are unemployed, unhoused and without help from family or friends—the day is long. Especially in very cold or very hot weather. Paid access to computers can be expensive at copy centers, and most restaurants and coffeehouses will admit only paying customers. For the longest time, people in this situation spent their days in Washington’s central public library, located at Ninth and G Streets NW. The library offered free computer time, a large central lounge on the first floor and even the privilege of eating inside which is not allowed in most public libraries. There is a soup kitchen across the street, so you could cross, pick up your food and return for a brief repast before hitting Facebook again. But no more. On March 4, the Martin Luther King Library closed for renovations, a project that will take up to three years. The location was once a de facto resource for individuals experiencing homelessness. D.C. libraries even hired a social worker. 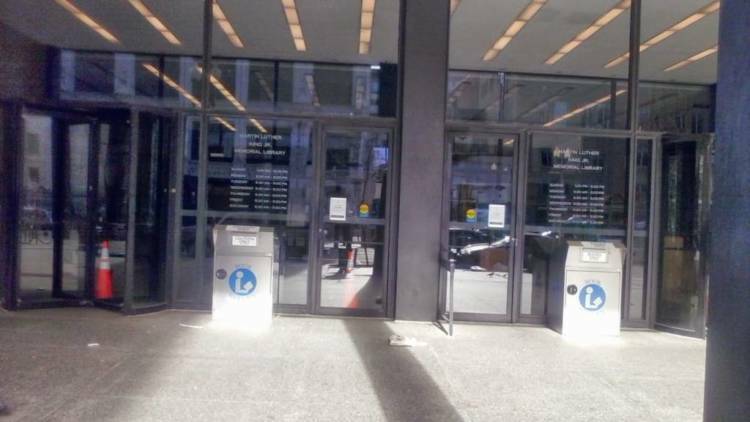 For three years, advocates, city officials and developers have held discussions concerning the library and decided that homeless people needed a service-oriented facility downtown. Three weeks after the closing, the Department of Human Services held a March 29 meeting with community members to see how they were being served or adversely affected by the new service plan. They met at First Congressional United Church of Christ, right next door to the closed library branch. “I fully believe that we will be able to find a downtown day center,” said Kathy Harris, the administrator of the DHS Family Services Administration. Harris described a two-part plan to assist the unhoused during the day, indicating that DHS has expanded hours at the Adams Place day center in Northeast. “We knew it wasn’t downtown, but it was already operating,” she said. Harris also described community engagement strategies used before the changes were brought online. “We visited every church in the downtown area,” Harris said. D.C.’s spiritual communities were open about their resources. “They told us what they did and what they couldn’t do. We took that information and created the [resource guide] card,” she said. “Everything everybody feared did not happen,” Harris said, adding that she is optimistic about DHS’s relationship with the downtown community. However, the community members in attendance still had questions. Michael Coleman, a consumer-advocate member of the D.C. Interagency Council on Homelessness, pointed out that during the inauguration, the shelters stayed open all day. “Who paid for [the shelters] to be open?” Coleman asked. Coleman pointed out that if the District could pay for the shelters to be open all day on Inauguration Day, certainly the funds could be provided for additional hours. Coleman worried that the unhoused are not having their needs met. Another shelter resident, who identified herself as Mickey Joe, seconded this by saying it does no good to call the shelter hotline. She also had multiple negative experiences at the Adam’s Place day center. Joe then left the meeting abruptly, stating that she had to be at Patricia Handy Place for Women by 4 p.m. in order to claim a bed. Another meeting participant described the staff at some shelters as rude and John McDermott, a founding member of the People for Fairness Coalition, suggested that representatives from this meeting go to shelters to discover what the homeless need right now.